Dairy must have one (1) dairy meeting & completed managerial record to show at the fair and two (2) dairy meetings to be in the auction. You must complete YQCA. 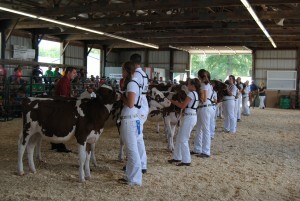 If you are in dairy judging, three (3) practices will count as two (2) meetings. The Veterinary Feed Directive (VFD) rules enacted in October 2015 require livestock farmers to correctly apply VFD Orders and retain all VFD Orders for two (2) years, producing them for inspection when requested to do so. VFD Orders may be stored electronically or as hard copy paper. What is a VFD? A VFD is a written (nonverbal) statement issued by a licensed veterinarian in the course of the veterinarian’s professional practice that authorizes the use of a VFD drug or combination VFD drug in or on an animal feed. This written statement authorizes the client (the owner of the animal or animals or other caretaker) to obtain and use animal feed bearing or containing a VFD drug or combination VFD drug to treat the client’s animals only in accordance with the conditions for use approved, conditionally approved, or indexed by the FDA. A VFD is also referred to as a VFD order. What Should Be on a VFD Order? Download the 4 page pamphlet here: Veterinary Feed Directive 2017 or here: https://uwmadison.box.com/s/yo8dga5ajltsgk06fs9ogiqqpukoz2ek . Please note that this is the most current information we have been provided at this time and can be subject to change.